Many of the social media services would like their creators to present a distinctive and more polished look to their landing pages. It makes sense, I guess. Your channel or landing page could be the second thing a person sees after viewing a video. It could help the person decide if they want to subscribe or check out what else you have. It does dress up the joint. YouTube, Twitter, Facebook and other social media sites all seem to want me to add a little pizazz to a profile or home page. Yeah. Here is the thing. Not all of us are gifted with Photoshop or The Gimp skills. We want to look good, we do. I'm trying to absorbed as much as I can from various creative blogs and web sites. In the case of YouTube, there are specific channel formatting issues that have to be considered. There are more details on the Channel Art Detail page. 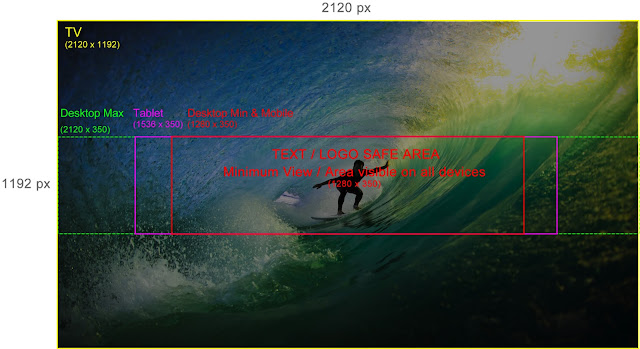 You can click the photo below to get the exact pixel dimensions needed for an acceptable banner/poster. Here is the crib note version; the image has to accommodate the various ways that users view content. Some people will be viewing video on desktop or laptop computers. Some will use smartphones or tablet devices. Others will hook up one of the afore mentioned devices to their digital television. Your channel banner has to accommodate all of those viewing possibilities. This isn't impossible. It is a challenge but challenge is good. Stimulates the brain. Now if you have that one photo like the one above that expresses the tone and essence of your channel then upload and have a great day. It is a little more complicated if you record video about diverse topics or you want to show something more personal. In other words, how do we make a personalized banner or poster with limited resources and creative skills? I don't have Photoshop or Photoshop Elements. I still haven't found my Corel Paint Shop Pro CD to re-install that software. I will say that I am now motivated to find it but that isn't the total answer. Even if I had that software I'd need a boost or some structural help in making a personalized banner or poster. All is not lost. We might have what we need and not know it. It can be an inclusive answer that doesn't leave the Android or Linux folks out in the cold. That is the topic for this week or how ever many posts it takes to find ways to make a simple personalized image banner or poster for social media sites. If you think this is straying too far from video, not to worry. There might be some alternative uses for that banner, i.e. animated use in a title or video.